When considering what fruits to eat with their condition or if to eat any at all, diabetics are often concerned with how their potential choices might affect their blood sugar levels. Do fruits raise blood sugar? Yes, they do. But is this really the ultimate criteria to guide our choices by? Definitely not. How a fruit raises blood sugar, more exactly how much and how fast, is a much better indicator of that fruit’s glycemic value and a far more accurate tool to predict its effects on blood sugar levels. Not to mention that fruits are overall healthy choices even for diabetics and anyone looking to better manage their blood sugar, as long as they are consumed in moderation. Some fruits nutritional makeup is also designed to provide benefits specifically for diabetes such as better blood sugar control, blood pressure numbers and cholesterol profile. Elements such as magnesium, potassium, vitamin C and B vitamins as well as dietary fiber are some of the nutrients known to produce benefits specifically for the metabolic condition. The glycemic index (GI) measures how fast the carbohydrates in a food raise blood sugar levels. Between 0-55 is a low GI. Between 56-69 is a moderate GI. Between 70-100 is a high GI. We may use them in a veggies salad, but tomatoes are botanically fruits. More important, they average a glycemic index score of only 15, making them one of the lowest glycemic fruits there are. This puts their glycemic load score at 1, maybe 2 for servings of 100 g, 149 g (the equivalent of a cup of the cherry variety) or 182 g (for a large, 3-inch diameter tomato). For the most part, they have less than 4 g of carbohydrates per 100 g, hence their very low glycemic status. Sweet cherries have a high carbohydrate and sugar content: 16 g of carbs per 100 g of fruit, of which 12.8 g are sugars and only 2.1 g dietary fiber. But they are surprisingly low on the glycemic scale, with a glycemic index of 20-25 and a glycemic load of 3-4 for a 100 g serving. So even though they are technically safe to eat with diabetes, it’s best to keep your intake reasonable to avoid exceeding your carbohydrate requirements. Whilst low on the GI and GL scales, with a glycemic index of only 25 and a glycemic load of only 3 (for a serving of 100 g), grapefruit does raise some concerns for diabetics. Compounds specific to the fruit, bergamottin, dihydroxybergamottin and naringenin, act on liver and digestive enzymes and affect how different medications are metabolized. Consequently, eating grapefruit or too much of it too often can interact with diabetes medication and medication for conditions associated with diabetes (high blood pressure, high cholesterol) by either increasing or decreasing their potency and biological effects. Find out more about how grapefruit affects diabetes medication metabolism in the article Can You Eat Grapefruit with Diabetes? Grapefruit juice is also unsafe if the diabetic person is receiving medication for their condition and can produce the same effects as the fresh fruit. In addition to this, there are several other arguments against consuming the fruit juice with diabetes. Find out more information in the article Can Diabetics Have Grapefruit Juice? If you are diabetic but are currently not on medication for your condition (you are managing it perfectly with diet and exercise), then you may consider the fresh fruit. If you can keep to a limited intake, you may also treat yourself to the juice from time to time. According to Montignac.com, the glycemic index for raspberries is only 25, the same as for cherries and grapefruit. Not everyone agrees and another proposed glycemic index for raspberries is 40, which is still a low score. Currently, there aren’t any reputable sources to put our minds at ease regarding the topic. But let’s compare the carbohydrate content and profile of fresh raspberries to that of other fresh fruits with similar glycemic values to get an idea of what their glycemic score might be. 100 g of raspberries: 11.94 g of carbs of which 4.42 g of sugar and 6.5 g of dietary fiber. 100 g of cherries (GI, 20-25): 16.01 g of carbs of which 12.82 g of sugar and 2.1 g of dietary fiber. 100 g of grapefruit, pink and red average (GI, 25): 10.66 g of carbs of which 6.89 g of sugar and 1.6 g of dietary fiber. 100 g of pear (GI, 38): 15.23 g of carbs of which 9.75 g of sugar and 3.1 g of dietary fiber. 100 g of apricots (GI, 30, 30+): 11.12 g of carbs of which 9.24 g of sugar and 2 g of dietary fiber. Taking a look at these nutritional values, it would appear that raspberries have about the same carbohydrate content as cherries, but 3 times more fiber which would mean it’s reasonable to assume they can have a similar glycemic index score of around 25 or lower (fiber lowers blood sugar). They are also fairly similar in carbohydrate content and profile to pears and apricots which are below 40, so it pretty much seems they at least have a glycemic index score lower than 40. Assuming a GI of 25, the glycemic load of raspberries would be 3, a low score (for a serving of 100 g). Assuming a GI of 40, the glycemic load of raspberries would be 5, so a low score (for a serving of 100 g). Mulberries are low-glycemic fruits, but how low exactly is still up for debate. 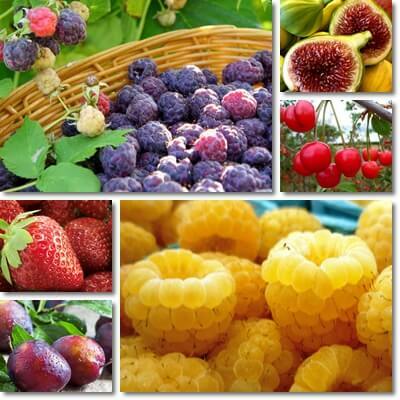 According to Montignac.com, the glycemic index of mulberries is 25, a low score. This would make their glycemic load for a serving of 100 g 2.45, so not even 3. On average, 100 g of mulberries has 9.8 g of carbohydrates of which 8.1 g sugar and 1.7 g dietary fiber. We notice here a modest carbohydrate content, most of which consists of simple sugars and very little dietary fiber. But the values are fairly similar to those of grapefruit which has a GI of only 25, so it’s not unreasonable to assume mulberries are this low on the glycemic index. Studies on type 2 diabetics and non-diabetics show Asian pears have a glycemic index of 25.9 ± 2.9 (estimated at 26) and 18± 5.4 (estimated at 18), respectively. Consult study. 100 g of Asian pear has 10.65 g of carbs of which 7.05 g sugars and 3.6 g dietary fiber, fairly similar to apricots whose glycemic index is 30, 30+. But given that Asian pears have slightly less carbs, less sugar but more fiber than apricots, it’s reasonable to assume their glycemic index is at least slightly lower than that of apricots. Given a GI score of 26 (for diabetics type 2), the glycemic load for a serving of 100 g of Asian pears is 3. Given a GI score of 18 (for non-diabetics), the glycemic load for the same serving is 2. Again, there isn’t much information on the glycemic index or load of blackberries. But 100 g of raw blackberries provides only 9.61 g of carbs of which 4.88 g sugar and 5.3 g dietary fiber, values similar to those of raspberries and grapefruit whose GI score is about 25. So the glycemic index of blackberries can very well be as low as 25 or lower (they are particularly high in dietary fiber which helps with blood sugar control, higher than other fruits with the same GI score). This would make their GL score 2.4, estimated at 2 (determined for a serving of 100 g). Fresh and unsweetened dried apricots have a low glycemic index score of around 30, 30+. However, because the dried fruit has a much higher carbohydrate content, the glycemic load changes dramatically between the two varieties. So even though they are technically both low-glycemic fruits, you have to eat a lot less of the dried fruit in order to enjoy limited effects on blood sugar (so serving size is much smaller). 100 g of dried, sulfured, uncooked apricots (GI, 30, 30+): 62.64 g of carbs of which 53.44 g of sugar and 7.3 g of dietary fiber. 100 g serving of fresh apricots – GL: 3 (low). 1 cup of fresh apricot halves (estimated weight 155 g per cup) – GL: 5 (low). 100 g serving of dried apricots – GL: 19 (moderate to high). 1 cup of dried apricots (estimated weight: 130 g) – GL: 24.4, estimated at 24 (high). 6 dried apricot halves/ 3 dried apricots (3.5 g weight of apricot half with 2.19 g of carbs) – GL: 3.9, estimated at 4 (low). – Values determined based on a glycemic index score of 30. Studies show guava is a low-glycemic fruit with a glycemic index score of 32.8 ± 5.2 (evaluated for type 2 diabetics) and a GI score of 31.1 ± 5.1 (for non-diabetics) – see study linked at no. 6. This would make the glycemic load for non-diabetics 4.4 and for type 2 diabetics 4.7, estimated at 5 (GL values determined for 100 g of fresh guava). One cup of guava at 165 g per cup has a GL score of 7.3 for non-diabetics and 7.79, estimated at 8 for type 2 diabetics. And at number 10, pears impress with a glycemic index score of only 38, a fairly low value. 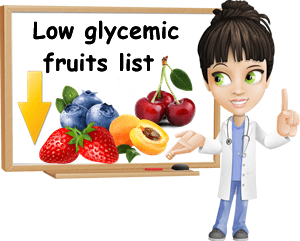 On average, 100 g of the fresh fruit has a glycemic load of 5.7, estimated at 6 (low score). One large pear at 230 g providing 35.03 g of carbs has a glycemic load of 13.3, estimated at 13 (moderate score). One small pear at 148 g providing 22.54 g of carbs has a glycemic load of 8.56, estimated at 8 or 9 (low score). Note: It’s important to understand that glycemic index and load values are merely estimates of the blood sugar effects of foods and they don’t take into account individual reactions to different carbohydrate intakes or profiles. People are different and even their conditions manifest differently and require personalized approaches. So while it’s great that we have these values to help us better understand which foods are good for diabetes and which are best avoided, please remember to take the information presented with a grain of salt and do not expect things to apply literally to everyone in the exact same way. Consider how foods affect you individually and eat accordingly, adjusting intakes and even substituting some foods with others if you feel it is the right thing to do for you.